I'm not sure what the quality difference will be. The biggest benefit is decreased CPU load and increased transcoding speed. Although it might not make big difference on quad core CPU, it makes a lot of difference on dual cores, especially when transcoding 1080p. Also we don't currently set quicksync to highest quality (we use balance preset), although I don't think that will make whole lot of difference. I think we could add another bitrate option (15, or 20mbit/s) which would also configure quicksync to use highest quality. The transcoding speed will decrease but it should still be more than realtime so it shouldn't matter. Actually, for the same bitrate I would expect quicksync to give at least comparable results. In order to have faster than realtime transcoding on most machines X264 has to be run with veryfast or ultrafast preset, which sacrifices quality for encoding speed. We're currently using QuickSync on balanced settings, so if the performance is good, there is some room for encoding quality improvement (regardless of bitrate). Found two more m2ts files that are on the blu-rays of Star Wars IV - VI that say "failed to parse file". They also fail on a local SSD when I copy them over, so it's not related to the other "failed to parse file" problem. According to Transport Stream Packet Editor they are perfectly OK and without errors. I have uploaded them in a ZIP for you to analyze, the archive is called "m2ts_parse_failed_star_wars_blu_rays.zip". It's the same issue - Missing PMT. I'm not sure why that happens - maybe they are considered valid for still frames in bluray, but they don't work as individual files. Got my HD4000 enabled and had to set the fake display to get it active. Buttery smooth seeks are awesome. Do you have Windows 8 or 8.1? I'm curious why the fake display is necessary for some users. I'm unable to play videos with HEVC encoding. The video plays okay in VLC 2.2 64-bit. I noticed the 1920x1080 HEVC does not play well in VLC 2.2, but plays fine in Daum PotPlayer. 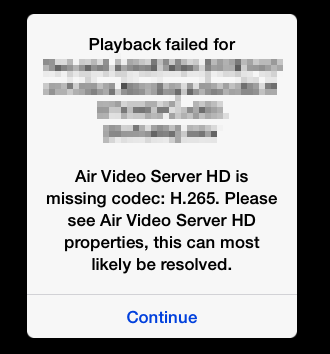 Tried to play in AirVideo but got this error. I installed the additional drivers, (LAV) but I don't seem to able to play the m4v video. why rmvb format is not running on this paid version? i tried over 10 different files of rmvb extension and none of them worked, everytime shows the message 'failed to parse file' when i try to open the file on mywhen i try to open the file on my iphone using the air video hd app. iphone using the air videopp. I'll take a look. And the logs would be helpful as well. Thanks for the reply, i will upload both of them there now. Hi, Have you received the files? Any ideas of why I'm still having that problem of 'failed to parse file' on the app? Does the problem persist if you download and install VLC from here? From the log looks like missing realvideo decoder, but that should give different error message (codec not found). It shouldn't end up as parsing error. That's definitely a bug. Windows 8.1 with a ASUS P8Z77-V Pro Thunderbolt, i7 3770, and a GTX 970. Also causes a duplicate mouse in the top right corner of my screen occasionally until I zip my mouse to the far bottom right of all screens, at which point it goes away for a while. The bugs are worth the trouble considering my whole family uses Air Video around the house and it runs so much better with the hardware decoding. How can I know whether my video card supports hardware decoding in Air Video? ciguli, have you read this? Today I've played around some more with beta3 and with my DVD collection and made some preparations for encoding tests. However, I've just realized that Air Video HD has different behaviors for handling live conversions and offline conversions. Is that intended? I am asking, because I wanted to convert some DVDs where Air Video HD doesn't seem to apply my conversion quality presets (that I typically used for live conversions), but instead seems to use hard-coded values with a very low bitrate (variable 1200kbps), which are always WAY too low. According to my own tests, I need about 5000kbps/5mbps (which is about CRF14) for some good DVDs with film grain and frame doubling to achieve transparent quality, like the 10mbps preset that I use for live conversions (which I am extremely pleased with, because it seems to work for everything perfectly). Can you please include fixed presets for offline conversion / download jobs, too? Is there a particular reason why you handle offline conversion jobs so much different (lower quality, shouldn't it be the other way around, because it is not realtime)?